There are several varieties of sage; scarlet sage (S. splendens) red flowers and used for flavoring, and garden sage (S. officinalis) with aromatic leaves used, when dried, for seasoning meats, Cleveland sage (S. Clevelandi), Fruit salad sage (S. dorisiana), etc. Others are: Clarey sage (S. sclarea), Mexican bush sage (S. leucantha), Variegated and Golden sage, Lyre-leaved sage (S. lyrata) is a folk remedy for cancer and warts, Pineapple sage, Purple sage (S. officinalis purpurea), Tricolor sage (S. officinalis tricolor), Holt’s mammoth sage (S. officinalis Holt’s mammoth), ornamental sage (S. farinacea victoria), meadow sage (S. pratense), berggarten, nana, rubriflora, elegans, icterina, Frieda Dixon, and on and on. 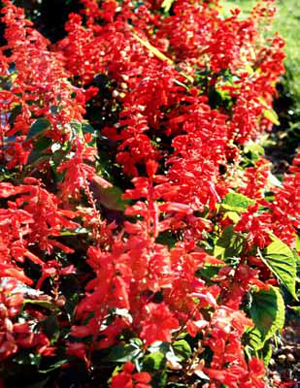 Salvia officinalis is a shrubby perennial plant that grows 2 feet high and is an aromatic, sun-loving plant with gray-green leaves and mauvish flowers. A strongly branched root system produces square, finely hairy stems which are woody at the base and bear opposite, downy, oblong leaves which may be entire or finely crenate. The floral leaves are ovate to ovate-lanceolate. Purple, blue, or white two-lipped flowers grow in whorls which form terminal racemes. Flowering time is June and July. Native Americans used a plant they called sage (Artemisia jrigida) or mountain ball sage. Blackfeet name “Ninny kaksa miss.” Arapaho name “Na ko ha sait.” Tea from the leaves was taken for coughs. Native Americans also used Small Sage (Artemisia gnaphalodes) was used as a steam bath along with the tea for young girls approaching maturity. Paiute name “Kose wiup.” Shoshone name “Pava hobe.” Also called “Ba wa zip,” or young people’s tea. Sweet sage (Artemisia dracunculoides), when dried, has a pleasing fragrance and was used in the Sun Dance with Small Sage (A. gnaphalodes). Black Sage (Artemisia nova) as a laxative. The Chinese use sage (Salvia japonica). Also, in China, the root of a related plant, (Salvia miltiorrhiza), called Dan shen, is used as a tonic herb. Sage is a native to the Mediterranean area, where it grows wild predominantly on mountain slopes and is commonly cultivated as a kitchen spice. Naturalized and cultivated in the United States for the past 3 centuries. Volatile oil, resin, tannin, and a bitter principle, triterpenoids, flavonoids, estrogenic substances, saponins. The oil is composed of camphor, salvene, 15% cineol, 30% thujone, and pinene. Sage, as its name implies, is said to carry powers of wisdom, as well as longevity. It was considered a valuable commodity in 17th century China, when merchants would trade 3 or 4 chests of tea for one chest full of sage. Sage is known as a cure-all. Native Americans mixed the herb with bear grease to create an all-purpose salve. Sage tea mixed with vinegar was given during the time of the plague. In Cyprus and Egypt, after a great plague, the women were forced to drink sage juice, to cause them to be more fruitful. An ancient Chinese proverb says, “How can a man grow old who has sage in his garden”. The Chinese highly regarded sage so much they gave the early Dutch and British traders twice the amount of their choicest Oriental teas in exchange for it. The Chinese make fun of the American people; they buy tea at a high price for their tea; the Chinese buy sage from America for a low price and drink that for their tea. This tea will keep them healthy, the tea the Americans buy from the Chinese make them sick. Sage is very soothing and quieting to the nerves, while the tea Americans drink is a great cause of nervousness and headaches. 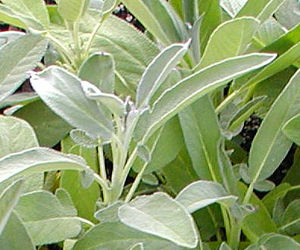 Traditionally, sage was associated with longevity, having the reputation of restoring failing memory in the elderly. It was also planted on graves. When weaning a baby, or when it is desired to stop the flow of milk for reasons of sickness, etc., drink sage tea cold and it will cause the milk flow to cease. Native Americans smoked sage leaves as pipe tobacco. One man was reported to be overworked, worn out physically, even had a twitching of his eye that never stopped. He made a tea of the dried culinary herb using 2 heaped tsp. of herb. One wineglassful after meals. Twitching went away, he could rest better, looked rested and felt healthy. Sage could almost be called a cure all. Sage acts as an antiseptic and soothes coughs and colds, flu, asthma, bronchitis, pneumonia, swollen glands, laryngitis, consumption, blood cleanser, laxative, increases menstrual flow, a relaxant for nervous disorders, headaches, and fevers, spermatorrhea, hair loss, calms nervousness, prevents night sweats, expels worms, treats quinsy, palsy, used in liver and kidney troubles, inflammations, typhoid, scarlet fever, measles, smallpox, soothes nervous troubles, relieves headaches. It also is used to inhibit perspiration. Good for the whole digestive system, dyspepsia, gas in the stomach. Can be used as a gargle or mouthwash to cure sore throats, canker sores, and sore gums, and as a lotion to heal ulcers, old wounds, varicose vein ulcers, sores, and skin eruptions. It will also staunch bleeding from wounds. Very effective for the treatment of cystitis. Sage has always been thought of as good for the brain, improving the memory and, in some cases, even as a cure for insanity. It is a powerful nervine and will stop any involuntary trembling of the limbs. Also, a sprig of sage in the wardrobe will keep away moths. 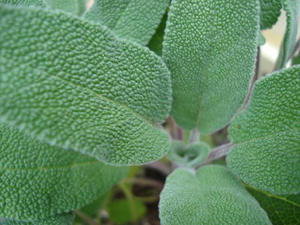 Sage is used for dandruff and is an effective hair tonic. It will make hair grow if the roots have not been destroyed. Once used for premature graying hair. Lyre-leaved sage (Salvia lyrata) is wild and found in dry woodlands of the eastern United States and characterized by lyre-shaped basal leaves, has properties like those of garden sage; but it also contains acrid substances, and its crushed leaves have been used to remove warts. It is generally used in mixtures rather than alone. Never steep herbs in aluminum containers. Use leaves collected before flowering. Infusion: steep 1 tsp. leaves in 1/2 cup water for 30 minutes. Take 1 cup per day, a tbsp. at a time. Children need smaller doses. Honey and lemon may be added to taste. Powder: take 1/4 to 1/2 tsp. powdered leaves at a time. Tincture: Take 15-40 drops, 3 to 4 times per day. Standard infusion: or 3-9 grams; tincture, 10-30 drops. The fresh leaves provide large amounts of vitamins A and C.
Sold as a culinary spice. It is inadvisable to “elevate” sage tea to the status of house tea, because its use over time can lead to intestinal disturbances. Extended or excessive use of sage can cause symptoms of poisoning. 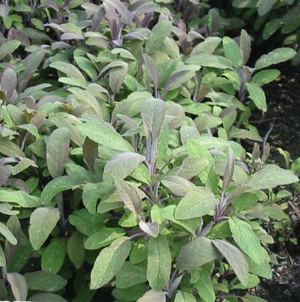 Avoid use of sage for epileptics, sage contains thujone which can trigger a convulsion in epileptics. Nursing mothers should avoid this herb as it suppresses mammary secretions. Avoid therapeutic doses in pregnancy; it is a uterine stimulant. Small amounts used in cooking are quite safe.